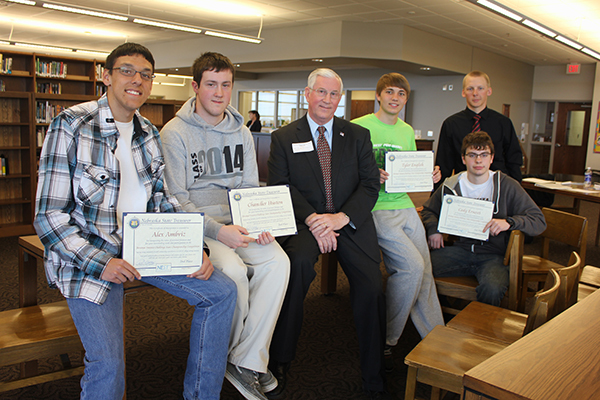 Treasurer Stenberg at Johnson-Brock High School with the first-place team in the 2013 Personal Finance Challenge. From left, Sylvia Smith, teacher; Nicholas Behrends; Treasurer Stenberg; Curtis Karel; Brandie Westhart; and Jennifer Davidson, director of programs and community development for the Nebraska Council on Economic Education. Each team member received a $2,000 contribution to a NEST college savings account. Members of the West Point-Beemer team that took second place at the Personal Finance Challenge are, from left, Alex Ambriz, Chandler Huston, Tyler English, and Cody Ernesti. With them are Treasurer Stenberg, center, and Steve Swett, business teacher, back right. Each team member received a $1,000 Nebraska Educational Savings Trust (NEST) scholarship. 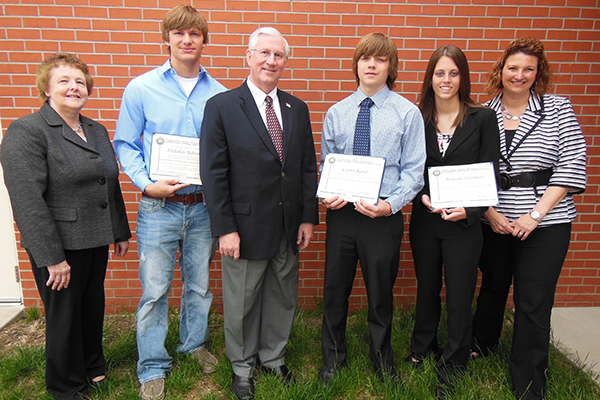 At Burwell High School with the team that placed third in the statewide Personal Finance Challenge competition. 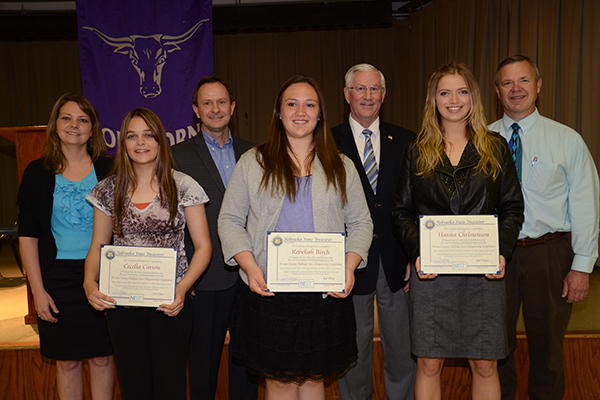 From left, Jennifer Critel, teacher; Cecelia Carson; David Sawyer, director, Burwell Economic Development; Rebekah Birch; Treasurer Stenberg; Hannah Christenson; and Burwell Mayor Charles Cone. Each team member received a $500 NEST scholarship. Nebraska Educational Savings Trust (NEST) scholarships, valued at a total of $14,000, were awarded Saturday to three teams of Nebraska high school students competing in the Personal Finance Challenge. First-place - Johnson-Brock High School, Teacher, Sylvia Smith; Students, Brandie Westhart, Curtis Karel, and Nicholas Behrends. Each team member received a $2,000 scholarship for a NEST college savings plan. The team will advance to the National Personal Finance Challenge May 2 in St. Louis, Mo. Second-place - West Point Beemer, Teacher, Steve Swett; Students, Tyler English, Cody Ernesti, Chandler Huston, and Alex Ambriz. Each team member received a $1,000 college savings plan scholarship. Third-place - Burwell Jr./Sr. High, Teacher, Jennifer Critel; Students, Hanna Christenson, Cecelia Carson, and Rebekah Birch. Each team member received $500 college savings plan scholarships. "My congratulations go to the winning teams on their excellent presentations in the 2013 Personal Finance Challenge, and my thanks go to the more than 1,000 Nebraska high school students who participated in preliminary events," said State Treasurer Stenberg, Trustee of NEST and one of the judges at the Omaha competition. "The students impressed me with the quality of their presentations, as well as their depth of understanding of family finances and their poise and strong public speaking skills. They demonstrated a thorough understanding of complicated family financial matters and were able to bring resolution to issues that potentially could have led to family discord," Stenberg said. The scholarships are part of a broader financial literacy initiative being undertaken by the Treasurer's Office. "As the chief financial officer for the State of Nebraska and as a parent and grandparent, I firmly believe that we must emphasize and promote financial literacy for young Nebraskans," the Treasurer said. "That education will help them reach their goals and achieve their dreams." As part of the initiative, Treasurer Stenberg will visit fourth graders in two Lincoln schools on Tuesday, April 23, in recognition of Teach Children to Save Day, a national program created by the American Bankers Association. First National Bank of Omaha, the program manager for NEST, is coordinating events in 19 Nebraska schools in recognition of the day. The Personal Finance Challenge is sponsored by the Nebraska Council on Economic Education, a non-profit organization that organizes education programs, courses, and teacher workshops to improve students' economic and financial literacy. It is housed at the University of Nebraska-Lincoln and has centers at UNO, UNK, Wayne State College, and Chadron State College. Thirteen teams took part Saturday in the regional competitions in the three cities. Each team was given two hours to prepare a plan in response to a hypothetical scenario about family finances. To qualify for the regional event, high school students from across the state competed in a preliminary online testing competition. A total of 1,090 students, guided by 60 teachers, took part in the preliminary testing. "For the seventh year in a row, the student and teachers of Nebraska have stepped forward and shown that financial literacy is something that every Nebraskan can use to make better choices and live better lives," said Roger Butters, council president. "Please join with the Nebraska Council on Economic Education and the Office of the Treasurer in congratulating these outstanding students for their achievement. Also join with us in celebrating the students who participated in the preliminary online rounds of competition. With students like these, the future of Nebraska is guaranteed to be bright and prosperous." Jennifer Davidson, director of programs and community development for the council, said she was pleased with this year's participation in the statewide competition, noting that both the number of students participating and the number of teachers guiding the students nearly doubled from last year. She also said the content of this year's face-to-face presentations was commendable. "I am thrilled for the teacher and students from Johnson-Brock. They worked hard and clearly displayed a grasp of important financial concepts in their presentation," she said. "I look forward to the trip to the national competition in St. Louis with these amazing students. They are excellent representatives of the quality of education and the value we place on education in Nebraska."